To be honest, we have rather a slew of fancy afternoon tea sluttage to engage in soon with the advent of H-J’s mum but a recent-ish wedding anniversary led to the first of The Season at Salon de The de Joel Robuchon Its part of L’Atelier, albeit a much more casual and affordable place to wind away a Sunday afternoon. Cutting the crap, we went straight for the kill and ordered a High Tea Set for Two. 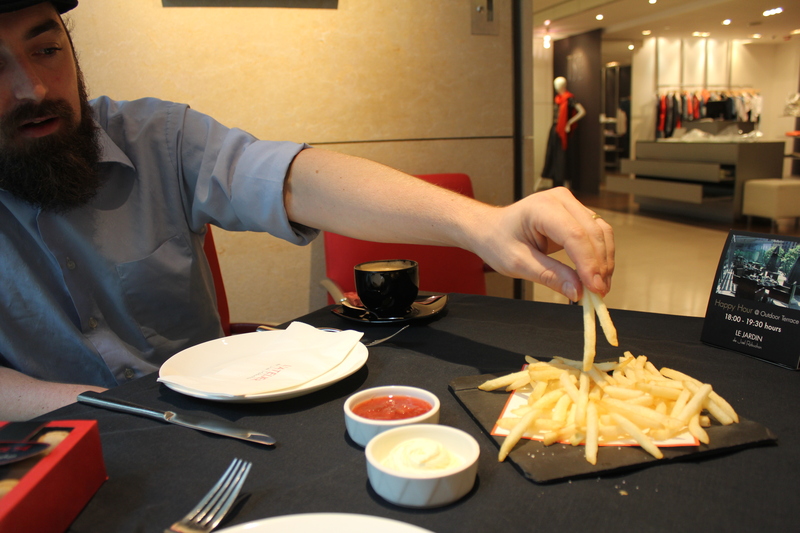 Oh and a plate of amazing Robuchon fries. And perhaps maybe also a box of macarons. 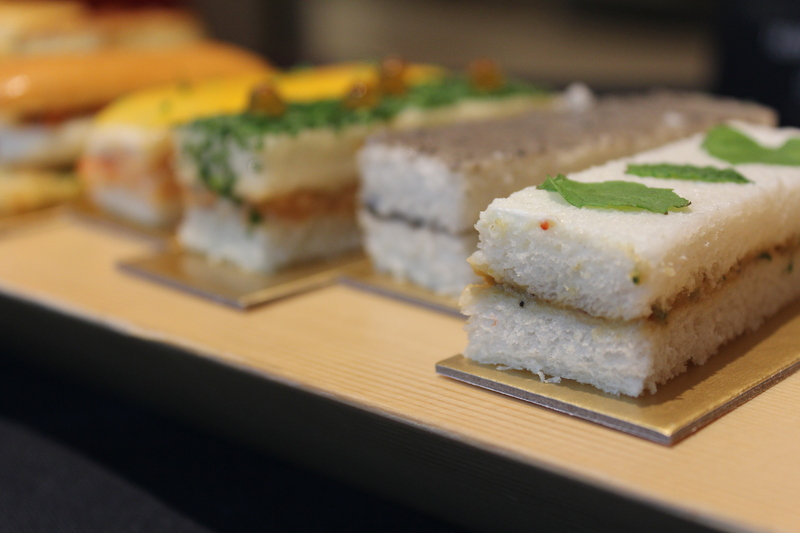 Anyway, the point is that this particular arrangement comes with a fine array of both savoury and sweet. The savoury platter arrived expeditiously and was stunning to look at. 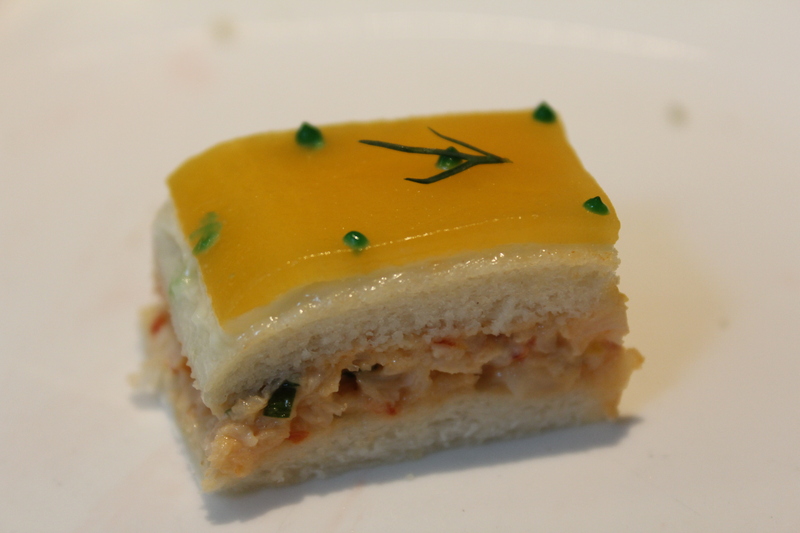 A gorgeous little Maine lobster and mango sandwich glowed from its midst, with its glossy green pearls. It was yum but the standout was an extremely French style black truffle sandwich – in this case, ‘style’ just mean copious amounts of creamy butter and a hit of soft, truffle. We wondered if we could just loaves of this home and take it work for lunch everyday…There was also a smoked salmon and salmon-egg sandwich, an eggplant sandwich, and a little goats cheese and salmon gourgere-y type arrangement. 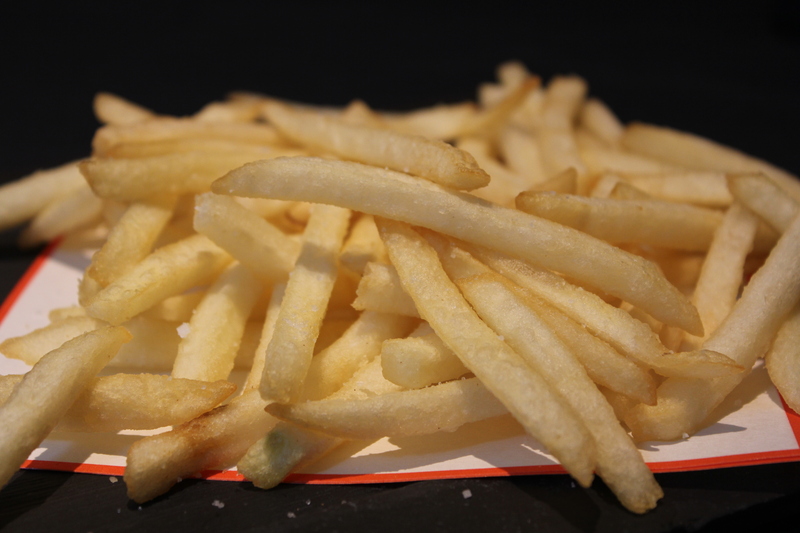 Fries aren’t just fries at Robuchon – they’re some kind of exquisite preparation of more than one round of frying and some rendered duck fat. Oh yeah, we got distracted by fries but there were a couple of home made (actually, what DOES that mean in a fine dining establishment?) 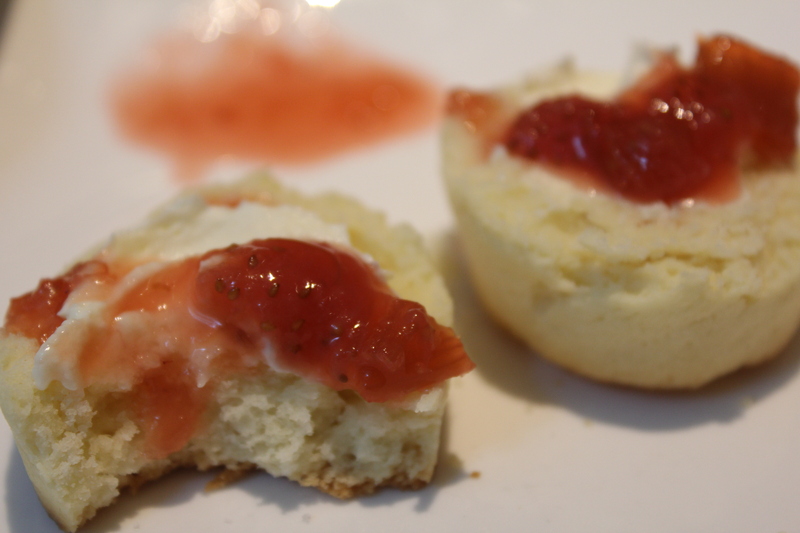 natural and lemon raisin scones with Devonshire clotted cream and strawberry jam, too. 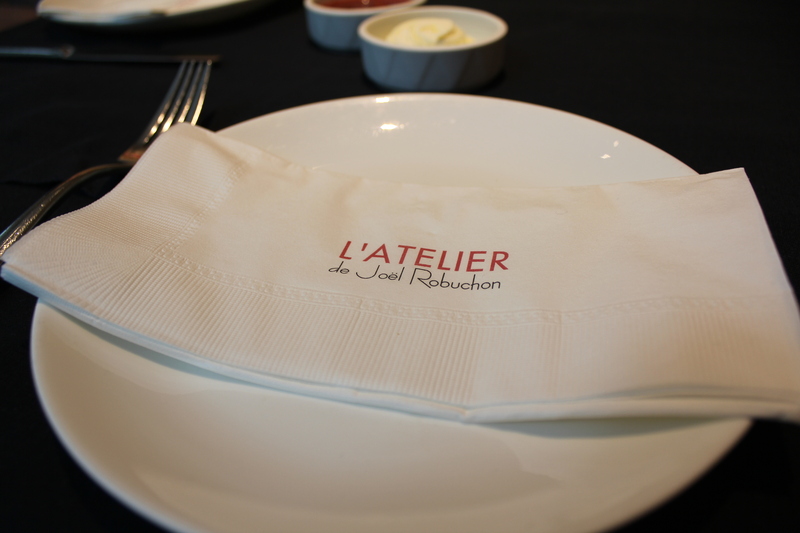 Let’s face it, though – after a butter and truffle sandwich with some duck fat fries nothing really comes close. It was a good intro to the sweet course though. A second platter arrived replete with shining, intricately detailed creations. 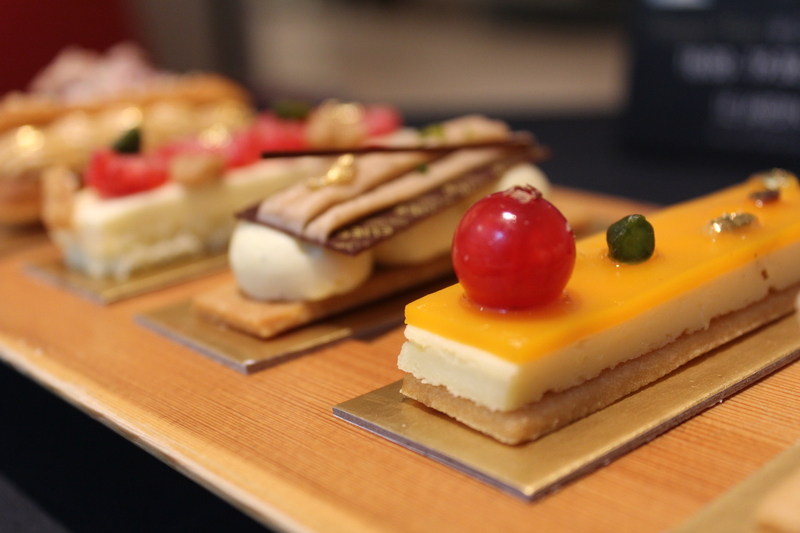 The Mont Blanc and the mango jelly cheesecake were pretty tasty. 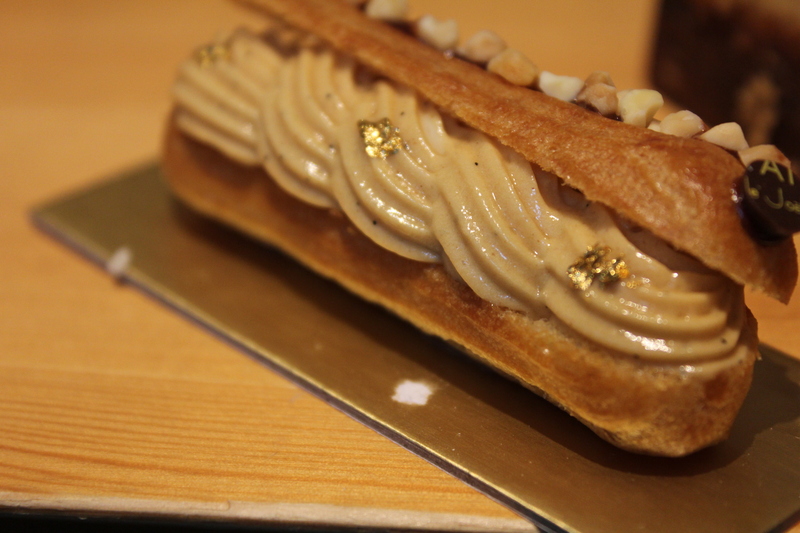 The Paris Brest was exquisite, from the soft waves of filling decorated with little glints of gold leaf down to the monogrammed chocolate button. 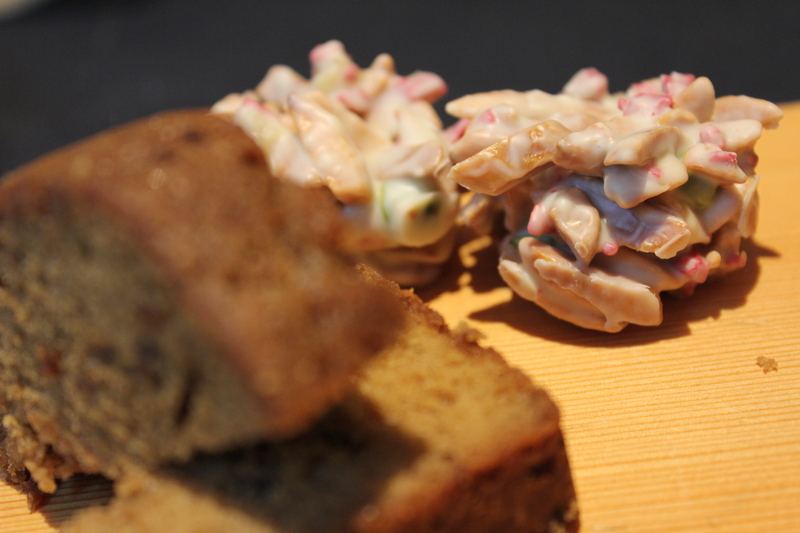 Rose petal and pistachio clusters and a fruit bread bought things a bit more down to earth – that is if your earth was a hybrid of everything familiar, comforting and wonderful about homestyle baking combined with the technique of someone that has earned 28 Michelin stars. Humble. 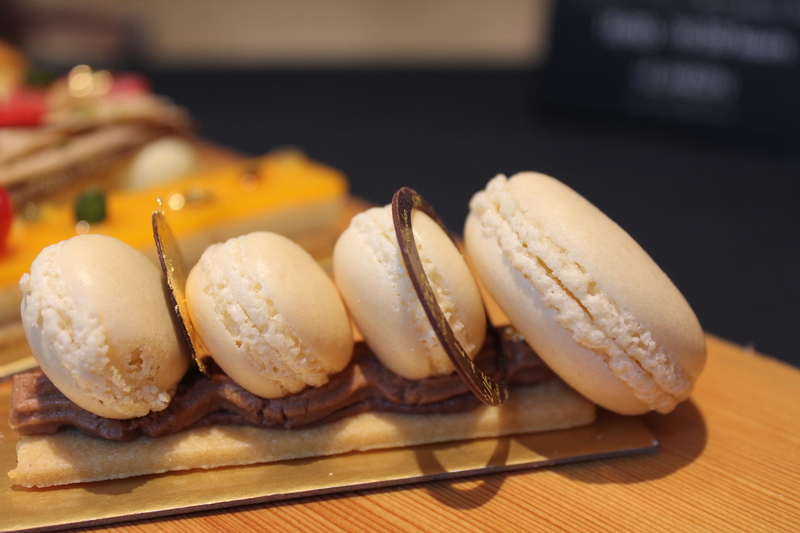 The star, however was the ‘Home Made Macaron Ganache’. Yeah, sounds totally home made! The teeny tiny macarons sat nestled into a bed of creamy choc and snuggled up with more monogrammed chocolate. 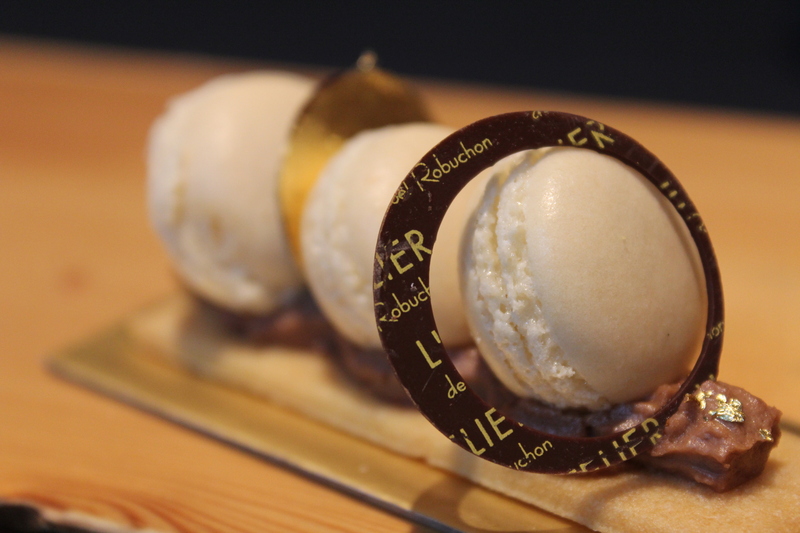 We’ve leaned a regular size macaron up against it for some perspective on just how delicate this dessert was! What we’ve realised we don’t have enough of in our lives (apartment from afternoon teas) is monogrammed stuff. Waterfallsandcaribous chocolates?! Wow very nice! 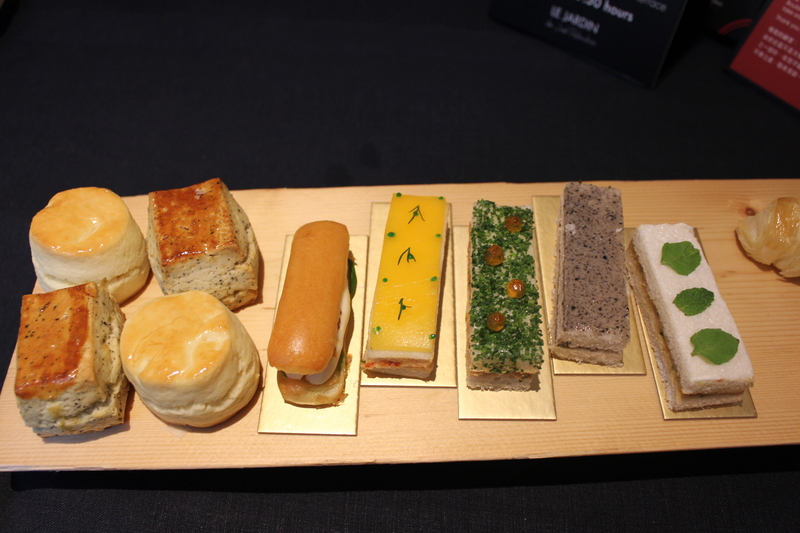 I love high tea in HK…this place I have to try next time I’m there. We went to the Peninsula Hotel for our fix. Very elegant and classical with a string quartet playing on the balcony. Excellent – the Peninsula is one of the places we are thinking of taking H-J’s mum when she’s here so its good to hear that you’ve been! Would you recommend it? Elegant sounds good! Thank you so much! Food is a great way to celebrate any occasion, hehe. awesome pictures! are you going to make a photo/table top book of all your food from around the world pictures? We hadn’t actually considered it but maybe…though we’d get super hungry looking at all the pictures, hahahaha. I want to eat it ALL!!! I don’t know even know which dish had me drooling the most. So jealous! We have three words for you: Truffle. Butter. Sandwich. I’ve decided I need to live in H-J’s handbag…full stop! Next time you’re here, let’s go on an EPIC foodie date eh? 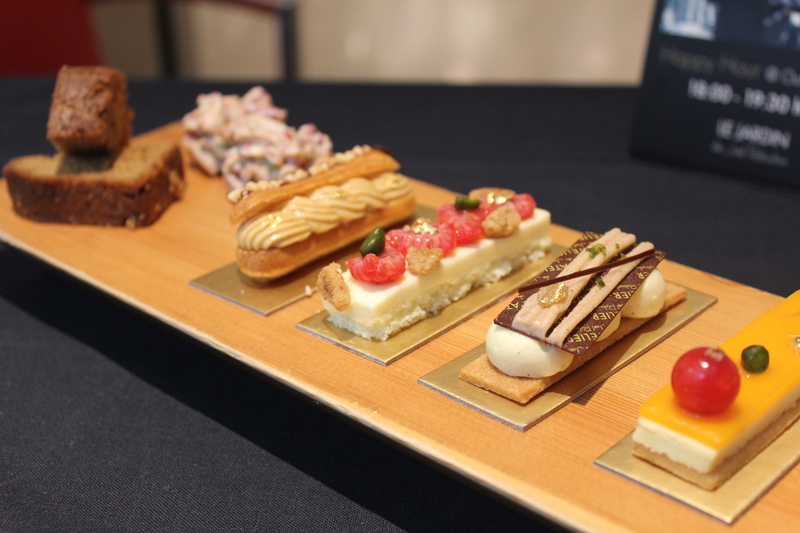 Perhaps the Peninsula High Tea, which we’ve been extremely remiss in not prioritising as yet?! Yeah, its just how we roll nowadays. 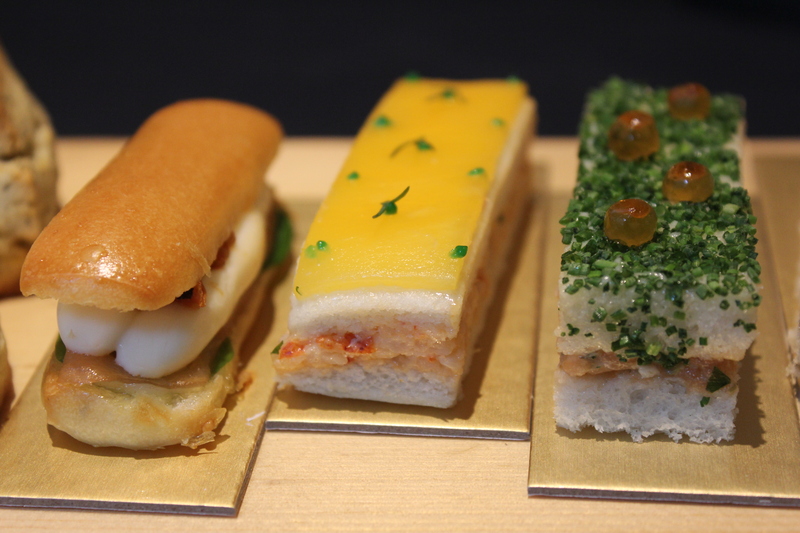 Gold leaf on pastries, gold leaf on toast, gold leaf on rice. You know, just the usual.